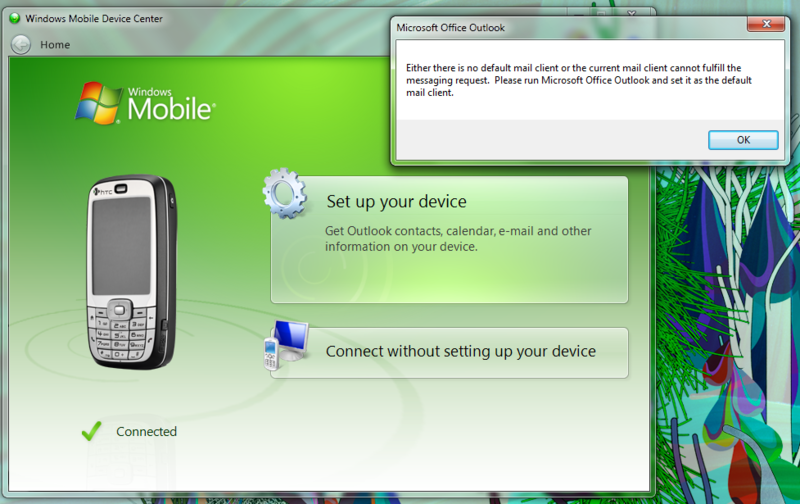 Subscribe to comments with RSS or TrackBack to 'Outlook 2010 TP does not work with Mobile Device Center'. yeap! I have installed today the Of2010 TP in my Win7 and my surprise was I can’t sync my data with my WinMo. Just OneNote and Files works! Office Team messed up! Not only did Outlook 2010 refuse to sync, it actually deleted all my Active Sync items from the mobile. Just a note of caution for anyone else feeling brave. I have read that newer HTCs can sync with it, but I don’t have confirmation of this. 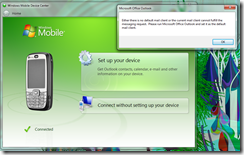 Same here… Just installed Win7 RTM x64 + Office 2010 TP and Windows Mobile Device Center seems not to recognize Outlook 2010 :(. Same for me. I installed the 2010 Beta and now my WInMbile 6.1 (HTC Touch Pro) wont sync. Have the release 2010 from Technet Sub and this is still not fixed. Doesn’t recogize that Office has been installed it says. Except of course it still recognizes OneNote as noted above. I have the AT&T Tilt 2 with WinMo 6.5 Prof, so it’s not an old phone. Forgot one thing. It only has the couple of contacts that are also in my Windows Messenger setup. That’s the only thing it kept.